SkullTec has raised the game by providing unprecedented 360° protection. Our patented gel pads are strategically placed around the headband and along the top of the head, where impacts occur most. Lightweight, comfortable and flexible, the standard black is quite fashionable. Which means kids are going to wear it — perhaps even after the game is over. The SkullTec cap allows heat to escape, keeping your head cool. The SkullTec cap weighs under 5.5 oz, is made from 83% nylon and 17% spandex, and is machine washable. Our patented gel pad technology gives 360° protection for the head, Designed to protect where most hits accure. The SkullTec cap is designed to fit easily under most helmets and can also be worn on its own.. 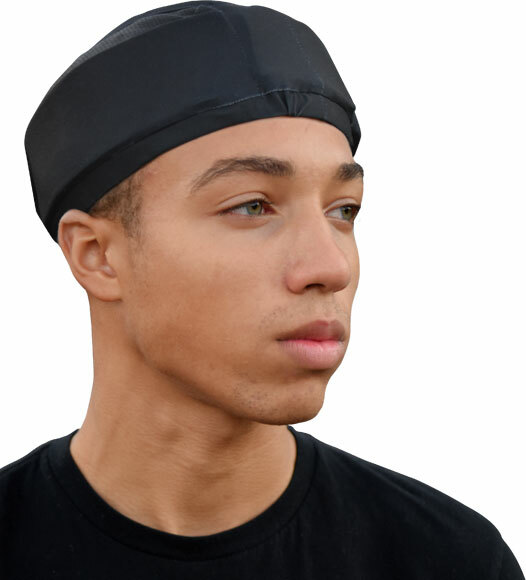 Recommended to be worn under helmets as added head protection Use in all extreme, contact sports and activities where a possible head injury could be sustained.